The elephant is Thailand's national animal. So it's only natural that King Mongkut in 1861 offered to send a pair to the United States. They were meant as a gift of the friendship between the two countries. Abraham Lincoln was president at the time. He was likely bemused and relieved at the distraction from America's then-raging Civil War. But he politely declined. He said his country uses the steam engine, so it would have no use for the working animals. The U.S. Embassy in Bangkok is showcasing historic gifts the two countries have exchanged on the grounds of Thailand's Grand Palace. This is part of the 200th anniversary celebrating the long-lasting relationship between the two countries. There are documents spanning two centuries. 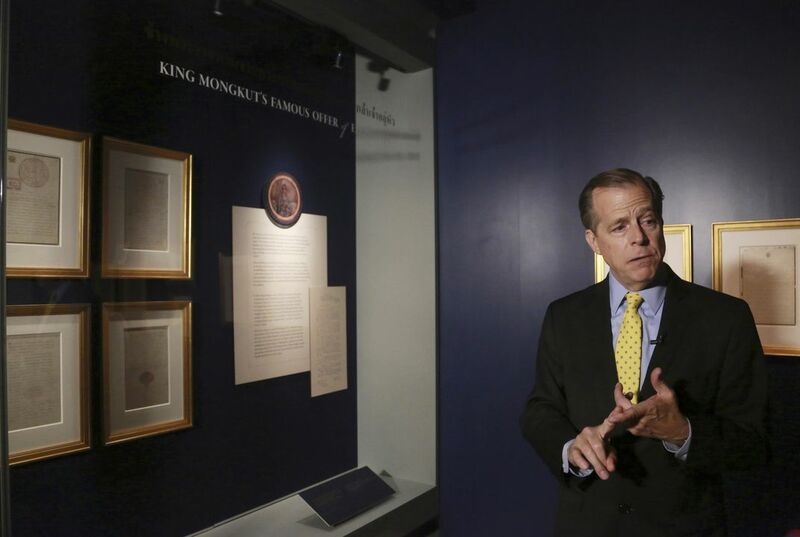 The showcase includes the first-ever official letter sent between the two countries in 1818. It was sent from a Thai diplomat to President James Monroe. Also included are some spectacular Thai objects d'art and portraits. Then there's the elephants story. It is documented among the exhibits. In his 1861 letters, Mongkut offered the elephants after learning they were not native to America. He also sent along three gifts. These included a sword and scabbard. It also included a photograph of the king with one of his daughters, and an impressive pair of elephant tusks. Lincoln was already president by the time the letters arrived a year later. He penned a reply and addressed the king simply as "Great and Good Friend." Thailand was called Siam then. It did not have a large enough vessel to transport them, the letter said. It continued: "In reference to this opinion of ours if the President of the United States and Congress who conjointly with him rule the country see fit to approve, let them provide a large vessel. It should be loaded with hay and other food suitable for elephants on the voyage. It should have tanks holding a sufficiency of fresh water. And it should be arranged with stalls so that the elephants can both stand and lie down in the ship. And it should be sent to us to receive the elephants. We on our part will procure young male and female elephants and forward them one or two pairs at a time." Mongkut then in his letter directs that the elephants should be kept away from the cold and under the sun. The letter also stated to "let them with all haste be turned out to run wild in some jungle suitable for them not confining them any length of time." 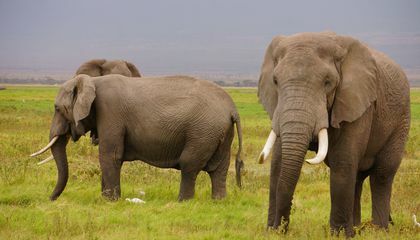 If elephants roamed forests in the U.S., smaller animals' homes may be destroyed by the elephants stepping on their homes. I think elephants would be able to survive, but the forests wouldn't be able to hold many of them. They would be able to survive, because there would be plenty of plants for them to eat. Elephants are a beautiful *specimen* that the Thai king wanted to share with America. The king wanted to *revolutionize* and help with the development of American technology. He said that he wanted to increase the *productivity* and use the elephants *refine* the building technique of the builders. As a *realist* and somebody who wanted the best for the animals that could not handle the cold temperature, Lincoln declined the offer of the Thai king. This is about how Thailand wanted to give America elephants in the 1800s. Being a realist, i personally think this is stupid. If the did this, elephants would be an invasive species and extinguish other animals in the region. This would revolutionize the natural world of America. Now we would would have a new biology book in school. In 1861 America was offered two elephant specimens. There evidence that documented the offer. Lincoln refused since he did not need the animals since America used the revolutionary steam engine. Lincoln extinguished the deal since thaw had no use for a biological species used for transportation. If elephants roamed our forest we would have to muffle their loud footsteps. They would not survive because the winter would be a revolutionized change. Also they wold freeze and find them as dead specimens. They would fun to study them alive in biology but to be a realist they have to stay in hot areas. This article is about how 1861 Thailand's leader King Mongkut offered to send a pair of elephants to the United States. They were meant as a gift of the friendship not to rupture or do anything between the two countries. But it didn't rivet Abraham Lincoln attention since instead of using animals they were already using different and a more revolutionize transportation. We basically would have extinguish the transportation of riding a animal/elephant in the U.S which is showed by evidence. This article was about the trade of elephants with Thailand. The article sums up the letters used as evidence, between Abraham Lincoln and King Monkut of Thailand. Monkut offered to give us some elephants. However, being more of a realist, Lincoln Kindly denied the offer. He said we had no use for the specimen because we used steam-powered engines. Lincoln seemed to be more concerned about our productivity rather our relations and trade with Thailand. The king really seemed to want to revolutionize the way we travel, however, Lincoln liked our way better. A summary of the article is that the king of Thailand, King Mongkut offered to send a pair to the United States. They were meant as a gift of the friendship between the two countries. But Abraham Lincoln was president at the time and said thanks but no thanks. I suppose Lincoln was fuming at the time because he found the offer a terrible idea. So he ruptured the idea completely. He felt the elephants were not some biology project or some specimens to be thrown around like nothing, they are real living breathing animals. This productivity really showed what a humanitarian Lincoln was and how much he believed in whats right. They probably would not survive because when hunters hear about elephants roaming the forests than they would go straight to the forest and kill them. This article is about an exhibit that celebrates Thailand and the USAs 200 year "friendship" anniversary. The exhibit showcases evidence from the nations very first encounters which usually consisted of letters and gifts. Once when Lincoln was president he received news the Thailand was offering to send a pair of elephants after they learned the specimen was not native to the US, but Lincoln kindly declined.